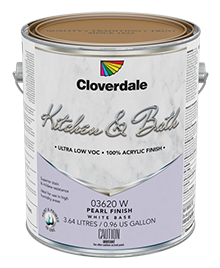 Kitchen & Bath Pearl is formulated with the latest acrylic technology and provides maximum durability with superior stain resistance and washability. Its superior adhesion with smooth flow and leveling properties make Kitchen & Bath Pearl the best choice where the durability of an oil base finish is required, particularly for use in kitchen and bathrooms. It is non yellowing and has low odour. This product features high moisture, mildew and burnish resistance in a fast drying, extremely durable finish. Kitchen & Bath Pearl has excellent colour retention, gloss retention and stain resistance properties. Approved by the Master Painter's Institute under category # 139. High Performance Architectural Latex Gloss Level 3. LEED™ approved. Environment Canada VOC compliant.